1. "Nefesh" ("a breathing thing"; Gen. i. 20 et seq., ii. 19, ix. 10 et seq. ; Lev. xi. 46). 2. "Beri'ah" ("creation"; R. V. better, "a new thing"; Num. xvi. 30). 3. "Ḥayyot" ("heavenly animals"; Ezek. i. 5 et seq., x. 15; Septuagint, ζῶον). In Apocryphal literature "creature" is the translation of κτίσμα or κτίσις ( or ), and denotes either creation in general (Wisdom. v. 17, xix. 6; Judith ix. 12, xvi. 14; III Macc. ii. 2) or mankind (Ecclus. [Sirach] xvi. 16; Wisdom xvi. 24). 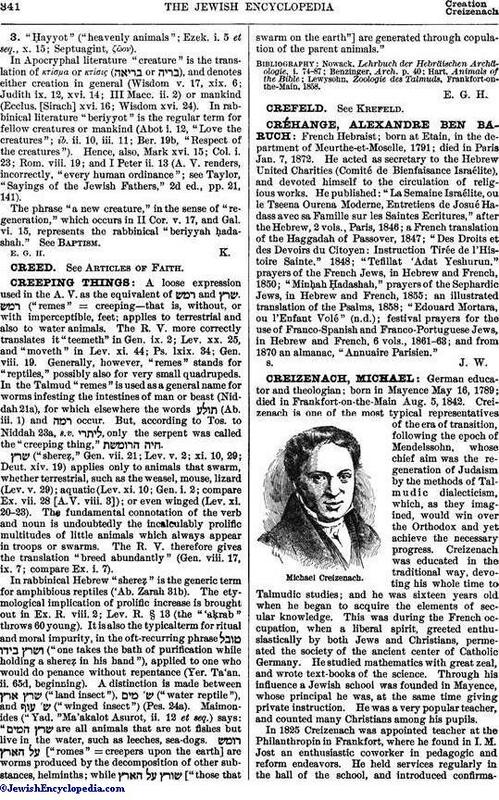 In rabbinical literature "beriyyot" is the regular term for fellow creatures or mankind (Abot i. 12, "Love the creatures"; ib. ii. 10, iii. 11; Ber. 19b, "Respect of the creatures"). Hence, also, Mark xvi. 15; Col. i. 23; Rom. viii. 19; and I Peter ii. 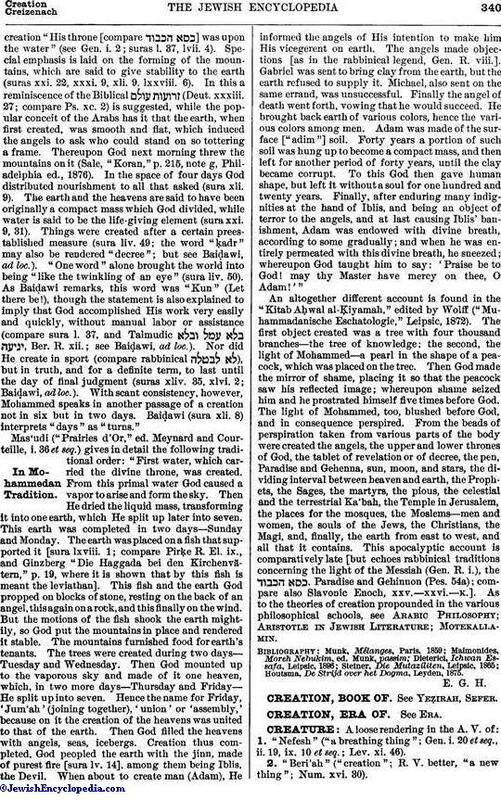 13 (A. V. renders, incorrectly, "every human ordinance"; see Taylor, "Sayings of the Jewish Fathers," 2d ed., pp. 21, 141). The phrase "a new creature," in the sense of "regeneration," which occurs in II Cor. v. 17, and Gal. vi. 15, represents the rabbinical "beriyyah ḥadashah." See Baptism.